Strength and Style. You can have both with the wall mounted 18" walnut shower seat from Freedom Showers. This luxurious shower seat option adds safety and support in your bathroom. 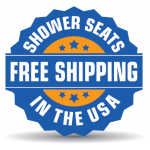 The polished stainless steel frame has a steel barrel which allows the bottom seat to fold up against the wall, only protruding 2 7/8” from the wall, making it the most condensed folding shower bench on the market. The dark, walnut slats are an inch thick, durable and easy to keep clean. Not just for aging adults. Anyone would enjoy the comfort of a walnut folding mounted shower seats in their shower, providing the option to sit while bathing. Help prevent falls with a wall mounted shower seat.